The struggle at Sussex University is the latest in a series of student rebellions against austerity and neoliberalism in our universities. 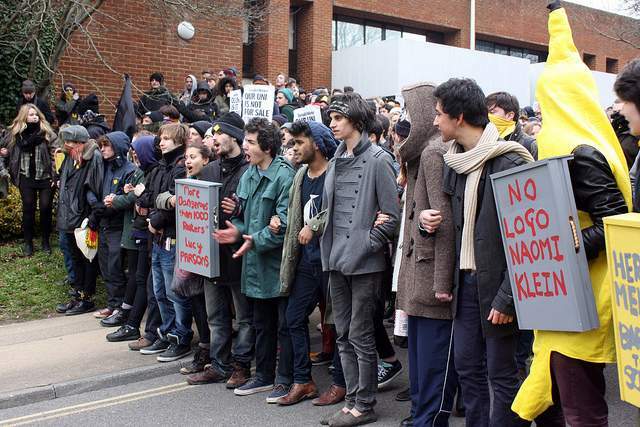 Occupy Sussex held Bramber House for 55 days and called a successful 2,000-strong demonstration against the outsourcing of 235 non-academic jobs. It has shown us how students can resist university managers implementing their new fees regime. The response by trade unions at Sussex University has, in contrast, lagged behind. The three campus unions – Unison, Unite and UCU – have finally called a membership consultation ballot nearly a year after the campaign began. But this welcome step forward would not have happened without a new factor: the Pop-Up Union recently founded by Sussex workers, which has pushed for ballots, built and supported Occupy Sussex, and argued for escalating the battle against Sussex management. The Pop-up Union was formed to break through the ossified local union structure on campus, characterised by conservative leadership and “zombie” branches. It is a symptom of wider political radicalisation on campus. The political experience of younger workers has propelled them to reshape and contest the established relationship between the rank-and-file and trade union bureaucracy at Sussex. It presents an exciting opportunity to reinvigorate both the student and trade union movement at Sussex and beyond. The University of Sussex has 760 full-time academic staff, 830 part-ime academic staff (total academic staff 1590) and 1190 non-academic staff*. Unite has the highest union density on campus, according to internal sources. Unison has the lowest: members have left in droves in response to the unwillingness of Unison leaders to head up a fight against privatisation plans. The local Unison branch didn’t support the student occupation or the 25 March demonstration — despite hundreds of local trade unionists from Brighton and Hove doing so. In its short life the Pop-Up Union has already recruited a membership that exceeds that of all three official unions in the soon-to-be-outsourced areas combined. Members have been recruited on the basis of committing themselves to strikes. Pop-Up Union activists are keen to stress that it doesn’t intend to replace the recognised unions. Rather it aims to provide a means for workers across campus to oppose the outsourcing proposals without breaking anti-union laws. The Pop-Up Union has been officially certified and can take industrial action legally. Yet the Pop-Up Union has not been universally welcomed on the left. Its opponents argue that it is a bureaucratic tactic that distracts from building up pressure inside Unison. Workers tell a different story, however. Younger members initially tried to win the local Unison leadership to back the Sussex Against Privatisation Campaign in June 2012. Activists were confident that the union would come on side, but the arguments dragged on without any tangible results. For months the Unison branch committee resisted internal pressure from the branch. Only when it was threatened with exclusion from a strike on campus did the local leadership call an indicative ballot. The decision to hold the ballot came just few days after the Pop-Up Union was officially certified. Now that the ballot has been replaced by a consultation, the Pop-Up Union gains in further importance. The argument that radical workers should simply take over their union branch also ignores the political reality of what happens when Unison bureaucrats are challenged. The story of the Senate House library cleaners at the University of London is a case in point. They tried to replace their existing Unison leadership: voting papers disappeared and the results were withheld for weeks on end. So the blame for any fragmentation of union organisation on campus lies firmly with the branch and national leaderships that have created these zombie branches in the first place — branches that have never been the focus of struggle and most likely never will be. Of course, it would be great to have had wildcat strikes or unofficial action led from below in defiance of both union bureaucrats and management. But these can’t be wished into existence. Organisation suffers from the burden of years of defeat. Union density is low and many workers have no experience of striking even for one day. Arguing for illegal strikes in these circumstances amounts to basing one’s tactics on where workers “ought” to be at, rather than where they are actually at. Workers want to take legal strike action. The Pop-Up Union facilitates this process creatively. The fact of a matter is that Unison at Sussex would not be calling any kind of ballot or consultation had it not been for a viable alternative union organised parallel to official union structures. Moreover, UCU and Unite at Sussex have been arguing for some time now that they would strike if a third union joins the action. The Pop-Up Union can fulfil this role if a ballot in Unison were to fall. The lesson here is that rank-and-file initiatives can take on multiple forms. For instance, electricians and construction workers recently took successful unofficial action while working within and building their Unite union. This has led some to argue that the Pop-Up Union at Sussex is a “substitution” for rank-and-file organisation that leads directly to wildcat strikes. But this argument ignores a crucial difference between the electricians and workers at Sussex. Unite’s leader Len McLuskey sanctioned civil disobedience by electricians. Unite officials encouraged socialists, Occupy activists and others to help shut down and occupy sites. Unison’s leaders have done the opposite. So at Sussex, creating the Pop-Up Union was a necessary first step to building a strong rank-and-file network and convincing workers that an industrial fight was even possible. It is a case study in how workers can exerts pressure on a trade union bureaucracy from below, and one that should prompt the left to critically re-examine some of our assumptions. Rank-and-file organisation remains the exception to the rule in Britain. The formation of the Pop-Up Union thus represents a qualitative shift by a significant minority of workers. It is an initiative that recruits from different sections of workers across the university — and can start to foster a culture of solidarity between those workers directly affected by privatisation and other workers on campus. Of course, there are many historical examples where a radical minority has cut themselves off from the mass of “dormant” workers by believing that taking action on their own would somehow awaken the rest of the working class from its long deep sleep. But the Pop-Up Union is not a “red union” in this sense. Its aim is to raise the level of workers’ organisation on campus and thereby force the established unions into taking action. And so far this strategy has worked well. So we should reject the argument that the Pop-Up Union necessarily leads to radical workers cutting themselves off from their colleagues on campus. As employees working at the same university, in the same cafés, canteens and services, they are in day-to-day contact with other workers at risk of losing their jobs. It is not a minority union that organises a handful of activists across geographically dispersed workplaces. The Pop-Up Union organises workers in one place, and represented more workers than Unison even prior to its certification. The accusation of “red unionism” can also be dispelled by examining the Pop-Up Union’s programme. The union does not differentiate itself by pushing “purer” left wing demands. It is not even explicitly anti-capitalist for that matter. Rather it is a single-issue union that fights for tangible gains for Sussex workers. Its members are willing to lead an escalation of action against the outsourcing of 235 jobs. As it says on its website, “The Pop-Up Union is a temporary organisation that does not seek to duplicate or compete with the other unions. Membership is open to all workers on campus whether you’re already in a union or not. There are advantages to joining one of the recognised campus unions which offer representation and a range of other member services”. This is not the language of a “red unionism” that denounces official unions as scabs and traitors. The Pop-Up Union, in contrast, is explicitly open to joint action and explicitly encourages joint membership. At its founding congress in 1918 the German Communist Party voted against participating in “reformist” trade unions. Lenin famously argued against this, insisting that communists must “work with the trade unions” rather than toying with “artificial forms of labour organisation” that would “leave the backward masses of workers under the influence of the reactionary leaders”. But we should note that Lenin was talking about the world’s strongest working class organisation of the time, not a moribund local Unison branch with two dozen members. And at Sussex the Pop-Up Union is anything but an “artificial labour organisation” — on the contrary, it has emerged organically from intense political struggle on campus. So it is unfortunate that some socialists retreated into dogma rather than learning from the best experiences thrown up by recent waves of class struggle. From Marikana in South Africa to Asturias in Spain, “alternative” unions have changed the balance of forces inside their workplaces and inspired millions to argue for strikes and an alternative to the capitalist system. The creation of a Pop-Up Union should be welcomed as a similar development here in Britain. Political mobilisation and struggle necessarily creates new organs, tools and structures. Some of these will be premature and will fail; others will succeed. The Pop-Up Union at Sussex has strong potential to act as scaffolding for the wider struggle on campus and to transcend the narrow confines of recent trade union struggles in Britain. The future of this project is of course uncertain. But we can be sure of one thing — the fight at Sussex will remain an immediate reference point for students and university workers in the struggles to come. *Many have pointed out that the original figure (250) quoted in the piece was wrong. The author accepts responsibility for this error. However, the core argument remains the same. One cannot dismiss that workers were ill-served by Unison and found themselves having to construct novel forms of organisation. It is a process many workers who have gone into struggle (New Unionism, Marikana etc) have often done.